McCormick & Co, the company that now owns and produces Stubbs BBQ Sauce, took legal action against the Austin landmark that shares its name. Christopher B. ‘Stubb’ Stubblefield Sr opened his first Stubb’s BBQ restaurant in Lubbock, Texas in 1968. On Sunday nights he introduced live music to the restaurant and soon had a line of musicians wanting to play there including BB King, Willie Nelson, Stevie Ray Vaughan, Linda Ronstadt, Johnny Cash, George Thorogood and Tom T. Hall. Whenever anyone played Stubb joined the acts on stage to sing Summertime. It soon became a Stubb’s tradition. The Lubbock restaurant closed in the 80s. Stubb moved to Austin in 1984 and started selling barbecue at blues club Antones. He then set up his own restaurant on Highway 35. That shut towards the end of the 80s. Stubb then started Stubb’s Legendary Kitchen and began selling his sauce at grocery stores. The company continued after his death in 1995 and that is the business now owned by McCormick & Co. 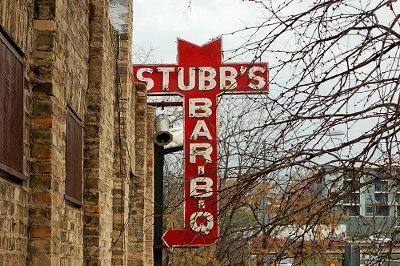 The current Stubb’s BBQ at 801 Red River, Austin was opened a year after Stubb’s death. The restaurant has played host to performances by Metallica, Foo Fighters, Duran Duran, REM and Willie Nelson and is one of the main SXSW live concert venues during the annual music festival. While One Worlds Foods wasn’t too precious about the change-over, its new owner McCormick & Co is. McCormick & Co inherited the trademarks for the Stubbs name when it bought One World Foods and took no time at all to start legal proceedings. The two companies have reached an agreement and the Stubb’s BBQ name will be phased out of 801 Red River soon.